The Western Sahara Campaign works in solidarity with the Saharawi people to generate political support in order to advance their right to self-determination and to promote their human rights. Our role is to lobby the UK Government and the EU. You can help us to ensure the UK does not ignore the voice of the Saharawi people. The history of support in Britain for the Saharawi people's struggle for self-determination stretches back to the 1970s. In 1977 the Sahara Action Committee was formed, which a few years later became the Western Sahara Campaign UK. This booklet puts on record the work and achievements of the campaign in Britain for the rights of the Saharawi. In particular, the booklet was written to acknowledge the enormous contribution made to that work by Mr Lamine Baali, who was the Polisario Front’s Representative in the UK from 1984 to 1995 and again from 2008 to 2012. 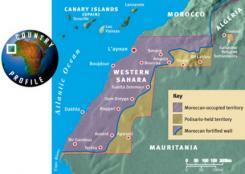 As the booklet shows, the campaign in Britain is more than the Western Sahara Campaign UK alone. Saharawi-focussed organisations such as Sandblast, and Rainbow Rovers, and other organisations such as the Woodcraft Folk and War on Want feature strongly in this history. Looking ahead, their work continues, and they are joined by new groups such as Adala UK and Students for Western Sahara, as well as growing international networks working on natural resources and human rights issues. There is so much still to do, but the struggle continues.